"Shampoo, rinse, repeat" or Groundhog's day on a bad acid trip are really two of the best ways to sum up Edge of Tomorrow starring Tom Cruise (Mission impossible; Jack Reacher)With the concept of the film, Edge of Tomorrow could have been boring repeat footage going through the same day over and over again but it luckily isn't. For those who like war movies, sci-fi thrillers or a good Tom Cruise flick, Edge of Tomorrow is a Blu-ray you may want to add to your collection. When the movie begins Major Will Cage (Cruise) is a Public relations guy putting a pretty face to the war and the military's latest technology "battle suits". After Cage angers General Brigham, played by Brendan Gleeson (Troy, Gangs of New York), he finds himself on the front lines with no combat training battling aliens called mimics. When he kills an alpha mimic at the exact moment he dies, Cage finds e is in an endless loop, reliving the same day over and over again, having experienced the same fate previously, Soldier Rita Vrataski (Emily Blunt, The Devil wears Prada, The adjustment Bureau) is an unusual ally explaining to Cage the fate that has befallen him and helping him to navigate his strange, new existence. Cruise gives a solid performance in this role portraying his usual action hero persona with a little extra something. When Cage first head off to combat, ill-equipped to fight and defend himself, the audience really senses his terror and confusion. Blunt also does a great job as the strong career soldier void of most emotion and, at times, robotic. A very good supporting cast including Bill Paxton Twister, (Apollo 13) as Master Sergeant Farell, help cruise and Blunt tell a believable story with an unbelievable plot. 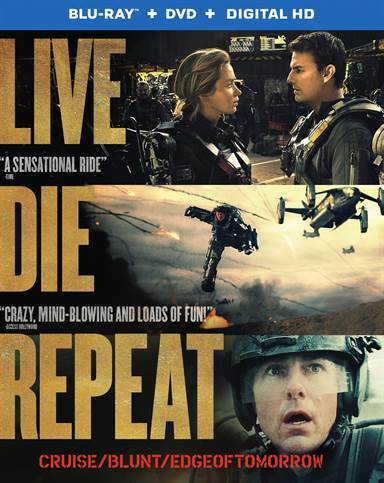 Directed by Doug Liman (Mr. and Mrs. Smith, The Bourne Identity), Edge of tomorrow is fast paced and purposeful. Like his other films, Edge of Tomorrow is easily identifiable as a Liman production with special care given to explosions while not sacrificing plot development. While Liman's other films weren't war stories per say, they all share a similarity to Edge that is uniquely Liman. The Blu-ray extras are a nice addition to the movie. A segment devoted to the exo-suit the actors wear, gives the audience an insight into the complexity of the equipment and helps us to see the "weapon" almost as a character of its own. Another segment focuses on the aliens and shows how much work and thought Liman put into them. A feature about the director himself is an interesting look as to how he approached the concept of this film and a look behind how he thinks about directing and film making in general. The only extra I felt was unnecessary was the deleted scenes. They didn't add anything unique or interesting to the Blu-ray. Download Edge Of Tomorrow from the iTunes Store in Digial HD. For more information about Edge Of Tomorrow visit the FlickDirect Movie Database.